It’s tarpon season boys and girls and our first full week of tarpon charters has been a great success. To be completely honest, the first tarpon trip 2 weeks ago was a dud but since then, we’ve whacked ’em. Yesterday was the latest installment of the “Silver King Air Show” as we put 8 fish in the air and landed 4 nice sized tarpon. Zenon Konopka (former Tampa Bay Lightning star and current New York Islander) and his buddy Pat Smith did a great job yesterday. After a few hookups and lost fish, the quickly figured out how to land them and boated 4 out of the last 6 fish they hooked. Will Parker (pictured), who had fished with me a week ago with his dad and brother, brought Jen Baker with him on a tarpon trip earlier this week. Jen went redfish fishing with Will and I 2 years ago and we wore the redfish out. This time though, she hooked in to a couple of tarpon upwards of 100lbs. Will hooked into 4 fish and landed 1 nice one. Other trips this week have produced 4-6 tarpon each and the fish have ranged from 60lbs all the way up to the 140lb range. We’ve put a few fish in the air that were well over the 150lb range but have yet to coax one of those all the way to the boat. (***Technical note: To put a tarpon “in the air” means hooking a tarpon and fighting it. Tarpon almost always leap into the air once hooked and many time they leap several times during the fight). The tarpon bite should be good from now through the end of July. So if you’ve ever wanted to catch a big “Silver King” (a.k.a tarpon) you’d better hurry to get one this year. 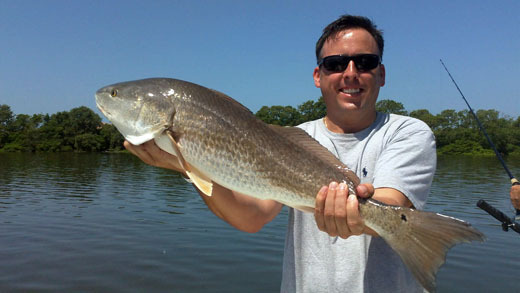 There are some really nice sized redfish around. They’ve been anywhere from 6-15lbs. There aren’t huge numbers of them but we’re getting big ones in the St. Petersburg area. Speckled sea trout remain strong on the grass flats and spanish mackerel are just about everywhere. While tarpon fishing we’re also getting some really fun by-catch. We’ve caught grouper, snapper, spanish mackerel, sharks and cobia.